Turn on your oven grill (broiler). Dice the avocado and red onion, and thinly slice the chilli (if using). Set aside. Add the crushed tomatoes, cumin, paprika, garlic powder and chilli powder to a small saucepan and place on the stove over a medium heat, stirring for 2 minutes or until warmed through. Take the saucepan off the heat and set aside. That’s your nacho sauce done. Place the corn chips in the bottom of a small shallow baking dish (I used a 28cm dish) and sprinkle with cheese. Place under the oven grill until the cheese has melted. This will only take a minute, so keep your eyes peeled. Remove the tray from the grill and top the melted cheese with the nacho sauce before layering on the chopped red onion, corn and black beans. Place the tray back into the oven for 5 minutes or until the ingredients are warmed through. 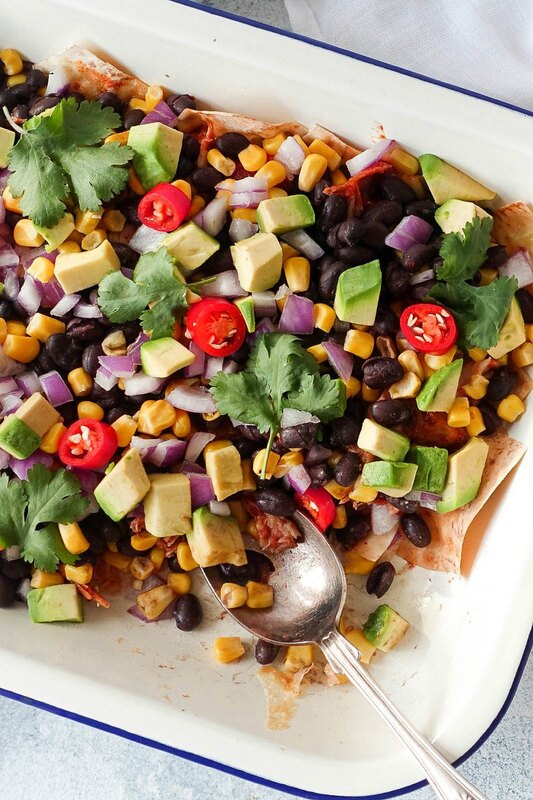 Remove your nachos from the oven and top with avocado, coriander and chopped chilli (if using). Serve with yoghurt or sour cream.